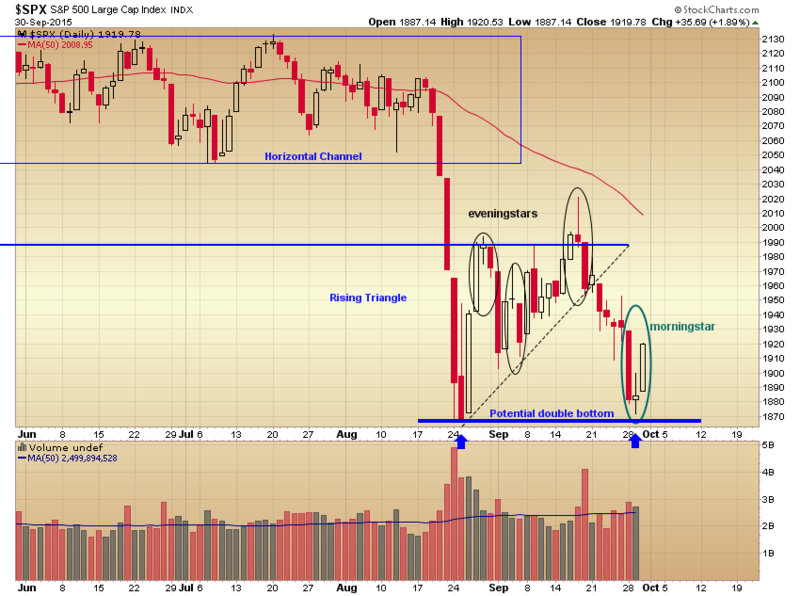 A bullish morningstar reversal pattern formed on the S&P 500 daily chart. This is a three period candle pattern that consists of a large dark down candle, followed by a narrow opening and closing range doji candle, and completed by a large white rising candle. It represents a transition from bearishness to bullishness and is of particular importance when it forms at key technical levels, like the August low. Three eveningstar patterns formed over the last month (bearish reversal patterns) while the index was moving higher in what developed into a rising triangle, the last eveningstar signaling the break below the triangle uptrend line which initiated the return to the August low area. The frequency of the formation of these particular bearish and bullish reversal patterns reflects the uncertainty in the market, and all candle formations require confirmation in the form of follow-through action, but the importance of the 1870 level has been reinforced. If it fails it would be a significant bearish breakdown, if the broader market is able to rally next week, it could embolden bullish sentiment, and start the conversation about a double bottom. Good write-up, I am regular visitor of one抯 web site, maintain up the excellent operate, and It’s going to be a regular visitor for a lengthy time. 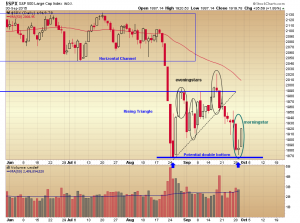 Pullback or Bounce Back ?